Pool A isn’t the first bar you’d hit looking for excitement at Nationals. The way the pools snake usually set a clear favorite against a clear 8-seed and then the 12- and 13-seed who will wrangle to stay away from the bottom of the pool. 2017 has delivered enough surprises already. We could all use a little predictability these days, and Pool A is ready to deliver. Seattle Riot is the undeniable no. 1 seed, and even on their hottest streak the Toronto 6ixers won’t be able to shake Riot from the groove they’ve found late this season. The 6ixers are your patented Canadian wildcard, only playing four of the other Nationals attendees before this weekend. Therefore it’s tough to accurately estimate how dominantly they’ll hold their no. 2 spot, but it’s unwise to underestimate the young Canadian champions. Texas Showdown was knocked from their 2-seed spot last year, and they’ll be hungry to do the same to the Canadians. Finally, Underground has a very real chance to knock out Showdown. They beat them at Elite-Select Challenge, and Seattle’s second team has the capacity to play at a higher level than a 13-seed. Seattle Riot has been here before. They were seeded first at Club Nationals last year (and in the top three for a decade), yet gold has slipped from their fingers every year since 2005. Riot learned a long time ago that seeding means little when you’re near the top, and they won’t breathe easy until they’re standing in front of the USA Ultimate sign with gold around their necks. This year’s Riot could do it. While they lost twice as many games this season compared to last year (four vs two), Riot’s polish and defensive excellence at Pro Flight Finale were enough to take out three of the top five seeded National teams. They cracked the code in Brute Squad’s defense with two tournament final victories over Boston this season, and their offense is unflappable. The team only lost two veterans from last year, and their rookies were all high-skill players who could onboard into Riot’s system easily, including Steph Lim (Fury), Aimee Kawai (Underground), Maddie Gilbert (Underground), and Lucy Williams (Mixtape). Rohre Titcomb shifted off the roster and into a coaching capacity due to injury, and longtime star Hana Kawai took her place after initially being a practice player this season. Captain Shira Stern submitted another stellar season downfield for Riot as their leading goal scorer, and the team’s best player, Sarah “Surge” Griffith, isn’t far behind. Captain Julia Snyder has come into her own in the backfield alongside Alyssa Weatherford and Kelly Johnson. Riot took all the pieces they were molding in 2016 and soldered them into steel. Pool play will offer little challenge to Riot on their way into the bracket. The no. 2 seed, the Toronto 6ixers, lack the personnel and the experience to surprise Riot, and neither Showdown nor Underground have the sheer firepower to take them down. Yet Riot’s path to the semifinals is never the problem. If everything goes to seed, Riot could face Fury again in semis, and after that, likely Brute Squad or Molly Brown. The former edged Riot out in the 2016 final, and the latter served Riot their most recent loss. Riot can handle the challenge. Their trophy shelves are full of silver, and they’re hungry – and so, so ready – for gold. In their sophomore year of existence, the Toronto 6ixers have accomplished quite a bit. They won the 2017 Canadian Ultimate Championships (CUC) in their first appearance, and this is their first year qualifying for the USAU Club Championships. They kept a low profile south of the 49th parallel during the regular season, but they won by big margins at Select Flight Invite and Chesapeake Open. The 6ixers operate through the power duo of Anouchka Beaudry and Laura Kinoshita, who together contributed nine assists and seven goals during the CUC final against Vancouver Traffic. Beaudry, only 19 years old and a 6ixers rookie, is the kind of backfield force that makes older players grumble with jealousy. Toronto’s season makes them a comfortable no. 8 seed overall at Nationals, but the team faces the challenge of peaking again after their CUC victory. The 6ixers don’t need to prove their grit in big game settings anymore, but the double peak blues could hit them at Club Nationals. To make matters worse, Toronto will be missing Kinoshita on Thursday for pool play due to exams. A hot game from either Showdown or Underground could unseat these young Canadians and shake up Pool A.
Texas Showdown added more red to their ledger this season than the rest of the pool, but their surprising 15-13 win against tournament no. 3 seed Molly Brown at South Central Regionals boosted Showdown’s ranking to no. 12 overall. This season’s Showdown deserves the spot. They broke seed last year in an exciting double game point upset over Wildfire, and this year’s roster is just as stacked with Texas talent. Showdown’s early season losses at Pro-Elite Challenge and the U.S. Open belie how dangerous they are point to point. Showdown can hang close in tight games, and their defensive line will generate turns from elite teams. 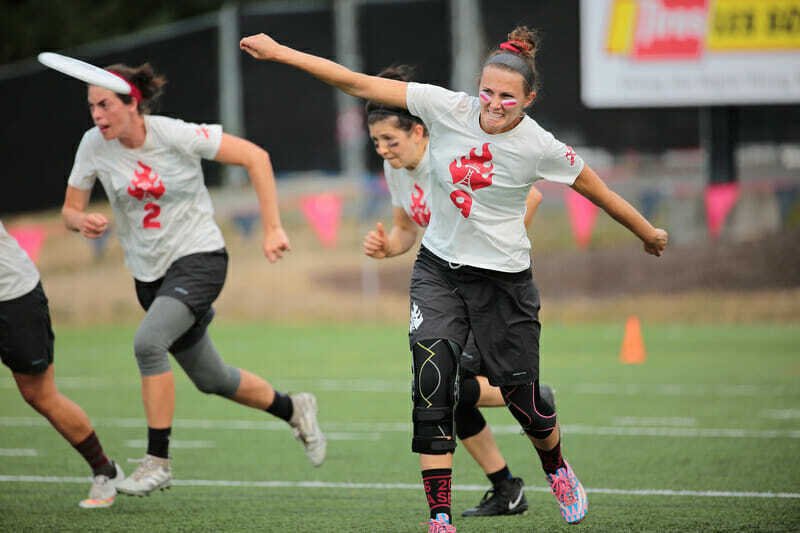 Katey and Bex Forth have been playing ultimate for nearly as long as young star Julia Schmaltz has been alive, and they’re still some of the toughest matchups for Texas. Schmaltz herself stepped into a bigger role during her second year for Showdown, where she gets the chance to facilitate offensive flow in the midfield more often than she’s the jumpball target deep. Showdown’s offensive line has shown their share of miscues throughout the season, and they’ll need dialed-in efficiency this weekend in order to reach the bracket. And in order to get out of bracket play, Showdown will have to keep Underground at bay. They lost to Underground earlier in the season, when Seattle nabbed a 4-0 run late in a close game to win. Showdown’s deep defense and their big marks will challenge Underground’s handler core to get creative with the disc. Seattle Underground rallied back in 2017 after they failed to qualify for Rockford last year. Underground added a bevy of elite talent to their roster, including Katy Craley (WUGC 2016) and recent transplants such as Hannah Kreilkamp (Fury), Taylor Hartman (Georgia Tech), and Anne Silver (BENT). Underground kicked off their season with a strong performance at Pro-Elite Challenge, and despite a limited roster, they battled their way to the final at Elite Select Challenge against Nemesis. At Pro Flight Finale, they took half on the title contenders, Molly Brown. Yet this season has offered its share of warning signs for Underground’s ceiling, too. Underground can play up to elite opponents, but they have a strong inefficiency streak against lesser or comparable teams, particularly if the team is missing core pieces. At Northwest Regionals, they lost to the Vancouver Sneaky House Hippos on Saturday, and they nearly lost to SHH on Sunday in the game to go. Texas is the only obstacle in Seattle’s path to the bracket, and Underground knows how to dismantle the Texas team. With all cylinders firing, Underground uses the full forty yards across and doesn’t hesitate to pull the trigger. This Seattle team is unlikely to reach the quarterfinals, but they’re fully capable of ruining another team’s pool play this weekend. Comments on "Women’s Pool A: 2017 Club Championships Preview"